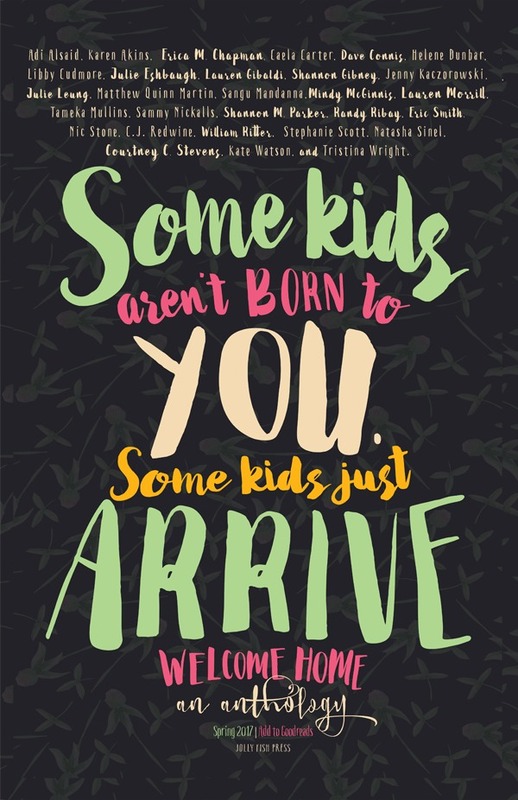 Several months ago, I found out the incredible Eric Smith was putting together an adoption anthology. The second I saw the announcement, I got literal, actual chills. I was especially excited because we are agency siblings (#TeamRedSofa) AND the anthology is being published by my publisher. And he still had openings for a few more short stories. I felt like the heavens were parting and a choir of angels was saying "Submit a short story, Freckle Face!" So taking liberal advantage of these connections, I messaged Eric and begged asked him if I could submit a short story for his consideration. I wrote him an almost embarrassingly long message explaining what adoption means to me--I'm an adoptive mom to a multi-racial family; I have cousins, nieces and nephews, a grandparent, and my step-mom who were all adopted. He was very gracious (which is sort of his hallmark) and said he'd love to take a look, while kindly explaining that there were a lot of submissions he'd be taking a look at and that he couldn't guarantee anything. You guys. I wanted this so badly, I could feel it in my bones. I wrote the short story that night and let it sit for a couple of days. In a matter of a couple of weeks, with the feedback of my critique group and agent, I submitted it. I loved the story, but I knew it was missing something. And when I got Eric's feedback a few weeks later, he hit on exactly what was missing. After incorporating his suggestions, I couldn't get through the story without sobbing. I sent it off to Eric again and crossed my fingers and toes. When I got the email from him saying he wanted the story, it was probably the happiest, most humbling moment of my career. Today, seeing the announcement go out into the world, I can't stop smiling (and crying). The idea that my kids will be able to read an entire anthology of short stories that will mean something to them and that I contributed to means the world to me. Even better, my personal choice continues to be granted. Prospects which were no place found are actually moving into my personal autoresponde. HOME DESIGN doesn’t give you empty guarantees. They really provide. Their revenue funnels and products are the best I've come across in this particular company! home art mania is one of the small specifics. As a previous investment conformity official, that gives us a tremendous quantity of comfort.